We had a great first day at the #NPGathering15! So much good dialogue. So many big things to think about. So much collaborating still to be done. We're full of energy and we believe day two is going to be equally, if not more, powerful. Trevor Potter, a former Chairman of the Federal Election Commission, is a Senior Advisor to Issue One, an organization that aims to make reforming money-in-politics a cause for all Americans, by unlocking new energy and bringing the influence of money into better balance with American’s policy goals. "We are repositioning money-in-politics reform as a civic issue for all Americans so that policymaking is more aligned with the long-term interests of the country than the immediate interests of a powerful few. In repositioning this issue as a matter of civic engagement that all Americans should care about, we’ll be able to unlock the kind of leadership, money, and energy necessary to create major legislative change. In doing this work, I’ve realized that people of all political stripes are eager to become involved in the cause once the right organizational vehicles exist to engage them in opportunities for victory and substantive change. To bring new constituencies into a fight, you have to give them the opportunity to create their own energy, and recognize that they will see the problem in differing ways. Our efforts will create a context in which people align around the problem and then, in turn, inform them of the different approaches and opportunities for reform." 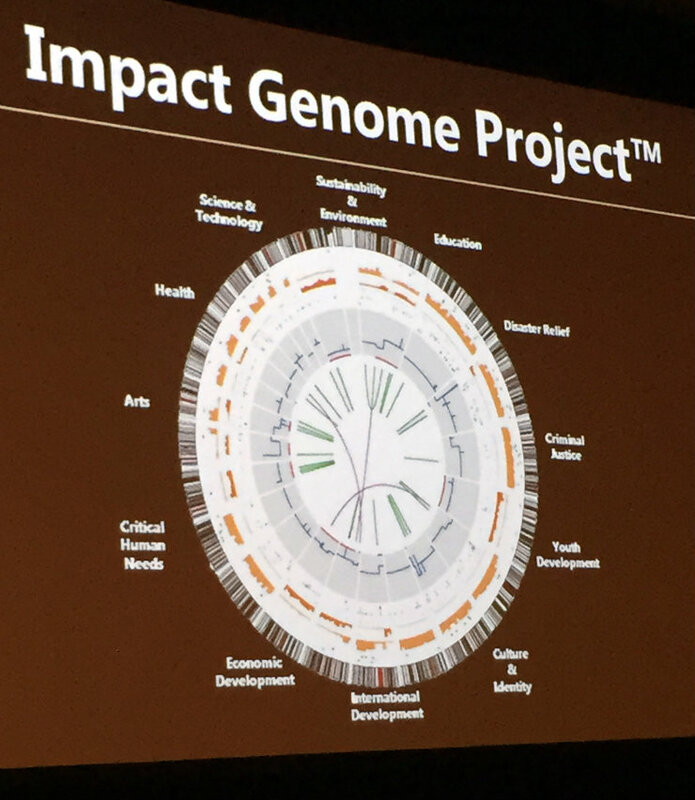 Impact Genome Project Graph from Mission Measurement and Travelers Foundation. 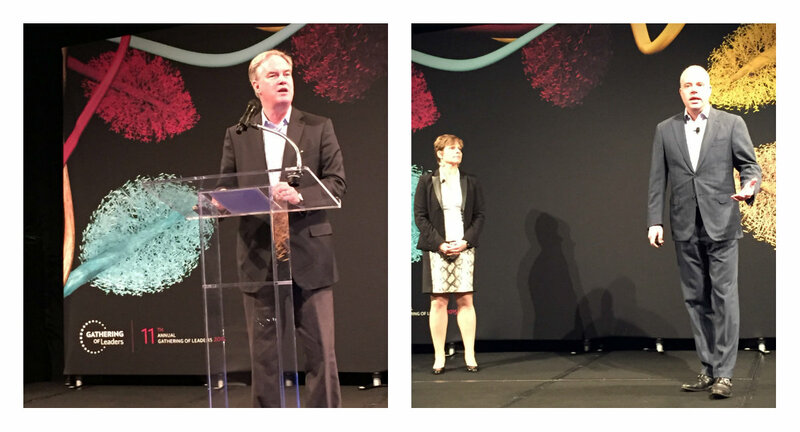 Marlene Ibsen, CEO & President of Travelers Foundation, and Jason Saul, Founder & CEO of Mission Measurement, made a provocative presentation about changing the way impact measurement happens in the social sector. "JS: Currently, there is no systematic way for us to measure social impact. As funders and practitioners, we make educated guesses about program success, and this is getting expensive. Without a standardized way to understand social impact, we cannot efficiently fund and produce better outcomes. Unfortunately, solutions currently leveraged — tracking outputs and academic evaluations —don’t get us the meaningful data we need now. MI: We had been frustrated by the inability to tell a coherent story of impact across our portfolio. Individually, grant by grant, we had a pretty good idea of what was being accomplished, but we could not roll up all the information into a bigger picture of impact. In addition, when we worked with organizations that were unable to report outcomes, or that were reporting disappointing results, we did not have a robust tool to help them find a better way. JS: After years of grappling with this problem, we created a way to leverage standardized data to predict outcomes for the social sector. We looked to other sectors that have successfully created standardized, predictive data. For example, the finance sector uses credit scores to predict financial outcomes; the health sector uses the Human Genome ProjectTM to predict health outcomes; and the entertainment sector uses Netflix to predict entertainment outcomes. MI: We had resolved to dedicate a significant portion of our education portfolio to be contingent upon outcomes and began a process to find an expert to help us do that. We found the concept of the Impact GenomeTM so compelling that we decided to sign on for further exploration. BOTH: Our bet is on developing a universal fact base that can predict the outcomes of social programs before we invest in them and increase the likelihood of improving outcomes."